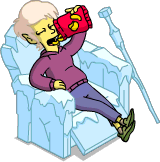 Jack Frost: Springfield. A dark night in a city without a soul. I’m Jack Frost. Sure, you know me as a wee pixie who draws delicate designs in the frost on your windows. But that’s just a cover for my real job: hard-boiled private detective. Jack Frost, because I frost the bad guys, put them on ice, and always stay frosty. Somewhere tonight, there’s a beautiful woman or down-on-his-luck loser who needs a private gumshoe. I actually wear sparkle boots, but you get the idea. Jack Frost: It’s a story I’ve heard a thousand times. Sap loves his missus…but maybe she don’t love him. Kirk: Luann is spending a lot of time at Tae Kwan Do… and the instructor is pretty hunky. Jack Frost: Thousand bucks a day plus expenses. I go through a lot of hair gel. Kirk: How do you solve cases anyway? Jack Frost: I peep through windows. Anyone busts me, I just say I’m making a pretty frosty picture. Jack Frost: Your wife’s pulled the wool over your eyes, Van Houten. She says she’s doing Tae Kwon Do, but she’s actually at the Italian market eating sugared fried dough. Marge: Homer, there’s someone peeping in the window! Homer: It’s Jack Frost! What’s the big idea, pixie stick? Jack Frost: It’s okay. I’m a private detective. 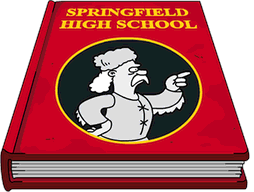 Homer: Yeah? Who are you working for? Marge: So, you’re just peeping. Jack Frost: You don’t like private eyes, do you Chief Wiggum? Wiggum: Us cops do things by the book. You can’t even read. Jack Frost: It’s not my fault pixie school stops at grade two. 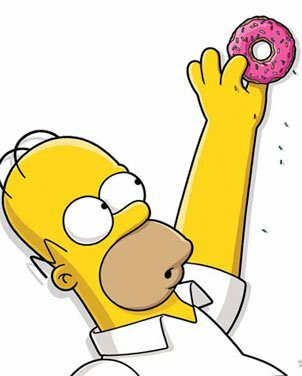 Say, can I borrow your donut? Wiggum: Wow, you’re making pictures out of the frosting. Nice! Wiggum: You’re all right, Jack Frost. But do me a favor…no more private eye stuff. And can you frost these donuts, too? Jack Frost: It’s a lonely life for a private shamus, in a town where God is just another three-letter word. ‘Course, the only savior I believe in is named Daniels, first name Jack. I’m the one guy nobody wants… until you desperately need me. So enjoy your holiday, but I’ll be on the job. ‘Cause evil never takes a vacation. And also this is the best time for frosting windows. 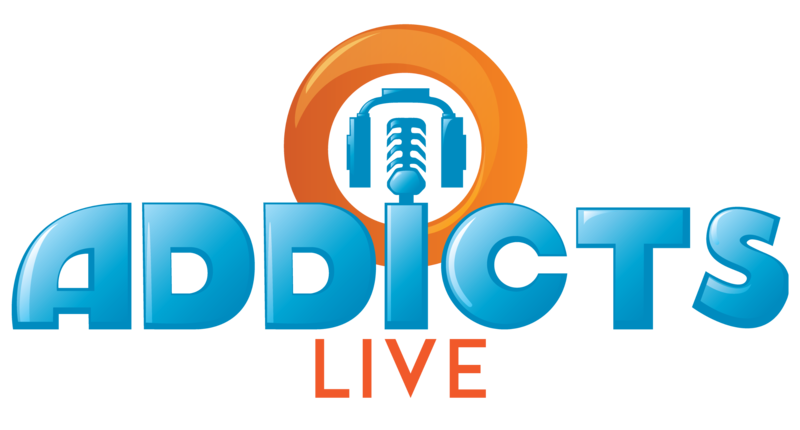 And that’s it…the details on the final Act 2 prize! Nothing. You’re done! Just keep earning those bonuts until the event ends. Remember spend ALL your Wrapping Paper and Magical 2x4s (Crafting) before the event ends. What are your thoughts on Jack Frost and the Candy Cave? 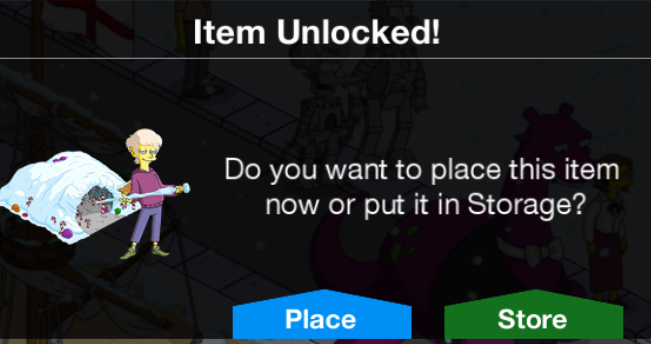 Have you unlocked him yet? houghts on his tasks or questline? 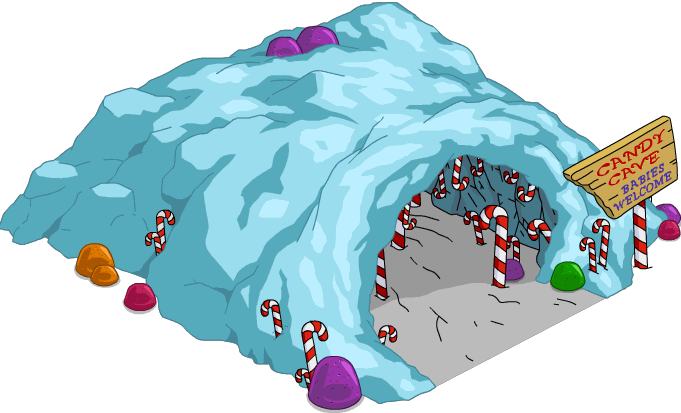 Where have you placed the Candy Cave in your Springfield? Sound off in the comments below, you know we love hearing from you! 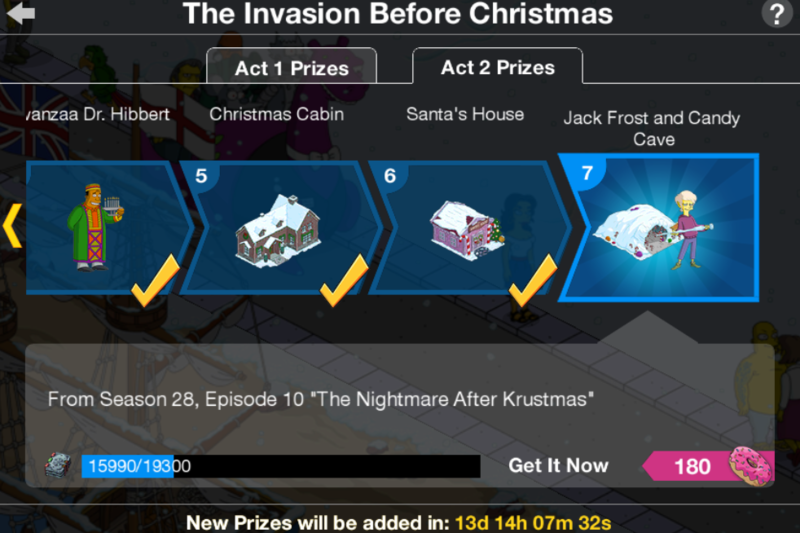 This entry was posted in Decorations, Tips and Tricks, Updates and tagged Act 2 Prizes, How do I get Jack Frost, Jack Frost Questline, Jack Frost Tasks, Rigellian Christmas, Sacred Tome Prizes, Tapped Out Christmas Event, Tapped Out Kang and Kodos Christmas, Tapped Out Tips and Tricks, The Simpsons Tapped Out, TSTO Addicts, TSTO Alien Invasion Event, TSTO Christmas 2017, TSTO Tips and Tricks, TSTO Winter Event 2017, What does Candy Cave Do, What does Candy Cave Earn, What does Jack Frost Do. Bookmark the permalink. Was there any history in the show of Jack Frost being a p.i. and a nihilist? I only recall one passing appearance with Wayne Gretzky, but perhaps I’ve forgotten another? Or is this additional characterization unique to the game? I think Jack Frost appearing with Wayne Gretzky was his only appearance in the show but he might of been mentioned in some episodes. I think Jack Frost being a private investigator and nihilist is what EA thought of for him to have tasks and a story for his questline to revolve around. Just had my 3rd round of regifting machine in the hope of getting more ice road, instead I got 10 crafting currency, what?? ?, suppose that’s the end of the Christmas event for me, nothing more to do!!! I’m really hoping they will make it possible to unlock the ice (with donuts) at the end of the event…similar to the cobblestone roads in last year’s Halloween event. I realised that Season 29 started airing on Fridays now instead of Sundays, I also noticed that the latest episode in the US and Canada “Gone Boy” aired on Sky one last week but I missed it. Hi, this time no New Year prize???? Seems so….. Interesting. 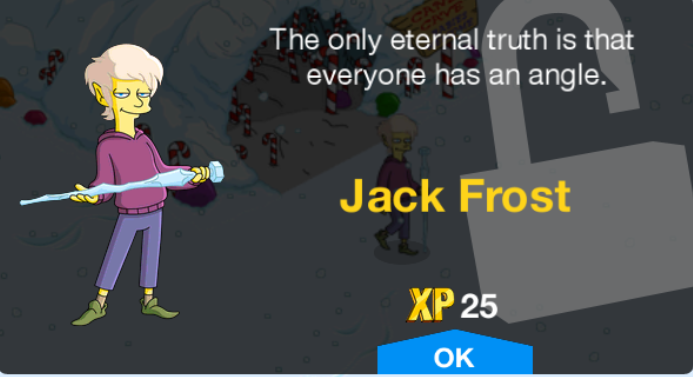 When I saw him in the character collection, I figured Jack Frost would be some sort of nature worship idol, but apparently he’s for atheists. Have you been touched by His Noodly Appendage ? Glad I’m not the only one that did that. Just found mine this morning. Thankfully, his quests do not rely on the event. 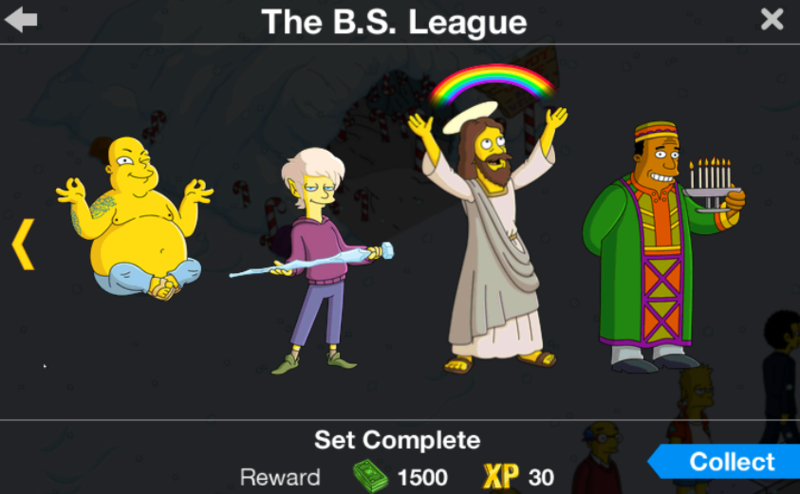 Do you have to finish part 5 of Jack’s quest line before you can earn bonus donuts? Did anyone else’s game receive a large update today that resulted in the game being super zoomed in? With this update I can no longer zoom out and is super annoying and takes forever to move around my town. I hope EA reverts to the previous zoom level. I did i thought I was the only one .. I seriously hope EA fixes this quick!! Yes, my zoom is wonky too. Very hard to move and collect $. Please EA fix this quickly. Yes! It’s so frustrating. It seems like every other update screws up the zoom, then they fix it, then they screw it up again. They should just allow us to choose our own zoom level. Yep! Android! EA has changed my resolution at least 10 times in 4 years and thus us BY FAR the worst. It was actually better than ever before this update.